Last week I talked about learning from my mistakes and this week I feel that last weeks mistakes paid off. I started with the one cradled board that was a mess last week. I cleaned it off to start over and decided that I would use all three I had for a triptych I had been sketching about all week. My sketching is all about free flow and what ever comes to my mind I will draw and color in, whether it’s from my memories or what I see outside or just a bunch of doodles. Last week someone gave me 25 copic markers and so I spent all week drawing with them. They were not my color choice so I decided to think and draw outside the “color box”. To draw and sketch with just the sketching in mind and not the colors so much. It was quite difficult because I am very drawn to certain colors and definitely have my favorites. It was really good for me to go outside my color comfort zone and doodle, draw and sketch with colors I don’t normally use. It really made me sketch from feelings and from my memories instead of just sketching with color. I strive to do things artistically and with my life that take me outside my comfort zone, not all the time mind you but quite often. It’s there where I really and truly learn what I am made of. Last week was one of those experiences for me, trying new tools and new techniques. I could have gotten mad; I could have pretended like it didn’t happen at all but my nature is to learn and I sure did learn a lot from all I did last week. This week I am very happy with the results of my work and my experiences from the past weeks of trial and error. This week was a success for me. Using colors I don’t normally use and doodling with copic markers not of my choosing. The encaustic painting was a success not only because it turned out compositionally and with the colors I used but because I chose to go outside my comfort zone last week and this week and take what I learned and put it into my painting. It felt really good to accomplish something really good this week. Above is a picture of before the painting began but after I put on the base layers of my medium.I first put 6 layers of clear medium onto each of the three boards. I put equal parts of damar resin crystals and wax medium into my pots to melt. While the wax was melting I went through my other wax colors and brought out the ones I felt would be the best for the this landscape. I really like the wax pots I have; I found them at Daniel Smith on-line. They are empty printers ink cans and they hold a really good amount of wax. The first color I added to the boards along the bottom was Celedon Green; I put about 30% damar resin, 20% pigment and 50% medium. I like how this color is pretty opaque. The next color I used along the top of the boards was turquoise blue and again it was about the same percentage of pigment, damar resin and wax medium. I put a small strip about 2/3 of the way down the board with a green gold pigment but with this color I used 40% damar resin, 50% wax medium and only 10% pigment. I wanted this color to be more transparent than the rest because I wanted a lot of contrast between the green gold and the thick heavy line below in Cadmium Orange. I painted layer upon layer of the Cad Orange to get it so raised up off the board. I made this color with 40% wax medium, and 50% damar resin and 10% Cadmium Orange Pigment; this pigment is so strong that one only needs a small amount to get the opacity you see in the picture below. The next thing I did was incise through the wax with a ceramic tool. The one I used has a wooden handle and a metal tip on the end, it’s used for trimming the tops of pots while throwing on a wheel. 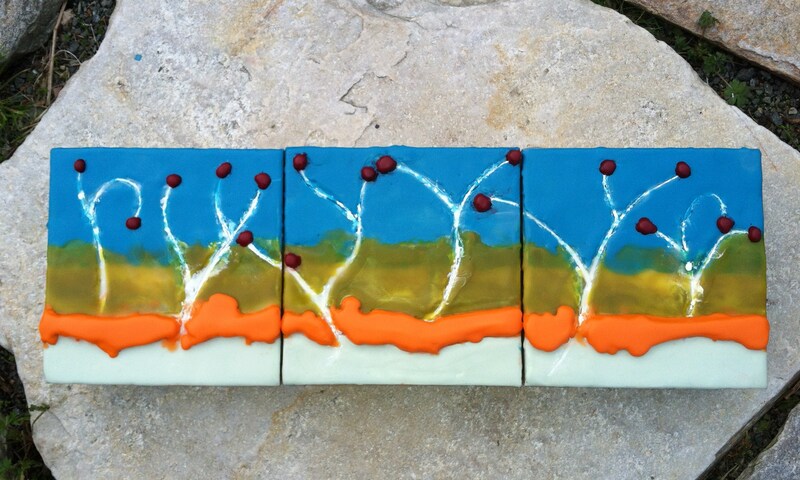 I had decided to do a type of landscape based on my sketches and the encaustic painting that I had started last week. I filled the lines with R&F Titanium White Pigment Sticks and let it sit for an hour or so. One of the problems I had last week was my impatience to complete a piece, so this week I decided to take my time and slow down. I really was getting excited about this piece and didn’t want my impatience to ruin it. While I was waiting for the oil paint to settle, I cleaned off the sides of my boards. I typically use my heat gun to warm the wax that has dripped over the sides and a metal ceramic rib to scrape off the excess wax. They work really good and get the boards really clean. 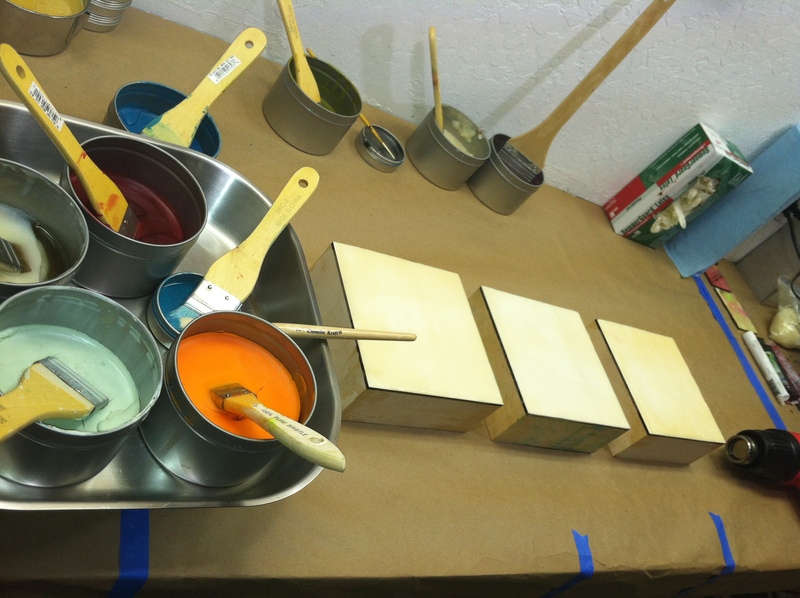 I have included pictures of all the ceramic and sculpture tools that I like to use with my encaustic painting. 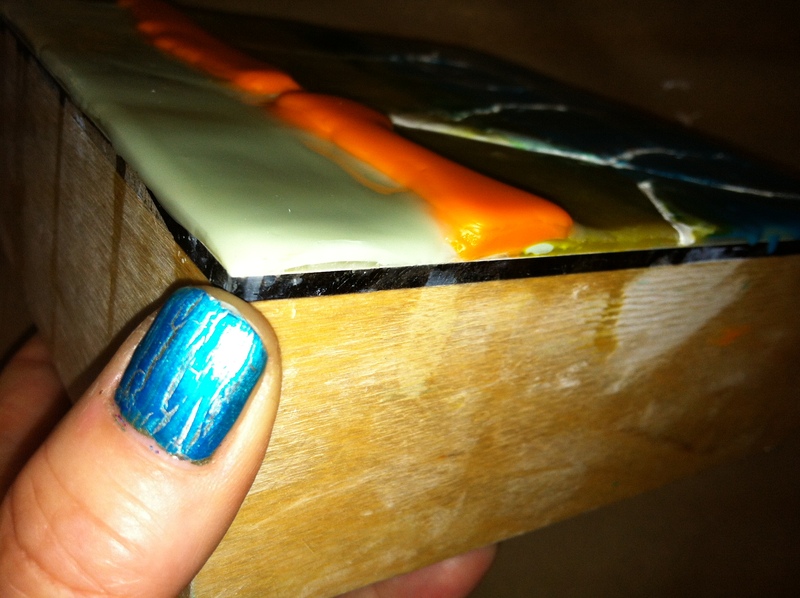 After cleaning the sides of my boards of wax, I put a thin coat of clear medium over the whole board. Enough to cover the white pigment I had pushed into the the incised areas of the painting. I then put 3 more layers of cadmium orange to heighten the layers between the depth of the white and the height of the orange because I wanted more dimension between all the layers of wax. My next step was to add the balls of red (Alizarin Crimson); last week I heated up a sculpture tool and melted holes into the wax and filled them in and then scraped back to get it smooth. That really didn’t work out very well, so this week I painted with the wax to make balls on top instead. I used the same percentage of wax, damar and medium as the Cadmium Orange and really liked how it turned out. I did some different tests to see what I like best and what was best suited for what I was doing and I like having the red high up off the boards along with the orange stripes. 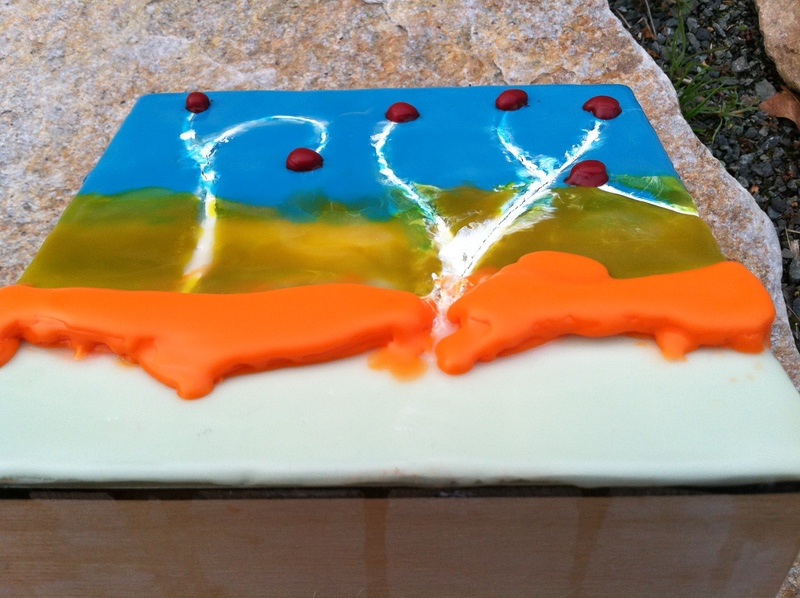 I am very pleased with the result of all my hard work, I really do love working with wax and the fluidity of it all. When it is all said and done; life is ever changing and fluid. Being open to what life has to offer is the best part of living.